A number of speakers at a public hearing before the Planning Commission on Monday said allowing accessory dwelling units could bring needed infill development, promote diversity and boost affordable housing. However, some speakers said they fear the units would mainly be put into use for short term vacation rentals, bringing possible undesirables into their neighborhoods. Many said if ADUs are allowed, it should just be for on-site owners. The issue is expected to come before the Planning Commission in April for a vote before going to the City Council in May. Officials said it is likely there will be an additional public hearing, perhaps in front of the City Council. Ethan Collier, a builder who is chairman of the Planning Commission, said, "Diversity makes for great neighborhoods. Right now we are building monolithic developments where everyone looks exactly alike and everyone has the same jobs." He said, "Just a small, small percentage of the community can afford the houses that are being built now." Mr. Collier said neighborhoods like North Chattanooga, Highland Park and Ridgedale "do have that kind of diversity." He said ADUs can be helpful. "You just have to do it right." Mary Kay Hyatt, Planning Commission member, also spoke in favor of ADUs, saying, "Face it, the world is changing. There are a lot of collaborative living methods." She said "We Baby Boomers didn't save a lot of money, and this could be a tool that would really help." She also said, "All renters are not dangerous bad people." City Councilman Darrin Ledford said ADUs "are a wonderful idea if done right." He said it would allow families to remain together on the same compound. However, Planning Commission member Jason Farmer said he was concerned about "the property rights of neighbors." He said the units may start out for family members, then shift to short term rentals. He said, "This impacts a lot of people." Suhir Morehead said she owns a house with a large lot in Highland Park, but she found that she could not build a small home for her on the lot. She said she ended up buying a triplex next door and converting it for her mother. She said with the ADUs there could have been five people living next to one another, but now it is just two. Lisa Floden said she came before the Planning Commission six years ago asking for ADUs. The resident of the Hilltop community said she was told that the only way under the current regulation is to have an attached garage that can be fixed into a separate residence. She said ADUs should be allowed citywide. 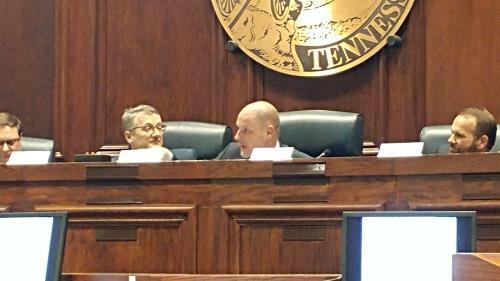 Several Highland Park speakers were in favor of the idea, while two from North Chattanooga were not. John Rowe said there are already short term rentals near his home. He said, "The influx of random people makes us uneasy." Another woman said the concept was not for North Chattanooga with its "postage size lots" and use of streets for parking, but might better be tried in East Chattanooga, saying that was an area that needs a boost. It was noted that ADUs are already allowed within the Form Based Code area. Some six or seven have been built in the almost two years with no complaints, it was stated.